Proteomix ion-exchange phases have been innovatively developed for achieving high ion-exchange capacity, a breakthrough technology for non-porous resins. Proteomix packing support is composed of a rigid, spherical, highly cross-linked poly(styrene divinylbenzene) (PS/DVB) non-porous bead with particle size selections of 1.7, 3, 5 and 10 µm. The PS/DVB resin surface is grafted with a highly hydrophilic, neutral polymer thin layer with the thickness in the range of nanometer. The hydrophobic PS/DVB resin surface is totally covered by a hydrophilic coating that eliminates non-specific bindings with biological analytes, leading to high efficiency and high recovery separations for biological molecules. On the top of the hydrophilic layer, ion-exchange functional groups are attached via a proprietary chemistry, resulting in a high capacity ion-exchange layer. Non-porous Proteomix ion-exchange phases are unique because they combine increased capacity and resolution with their intrinsic advantages of high efficiency and high separation speed. Proteomix ion-exchange phases are especially suitable for high resolution, high efficiency and high recovery separations of proteins, oligonucleotides, peptides, polysaccharides, cell lysates, nanoparticles and nanotubes. 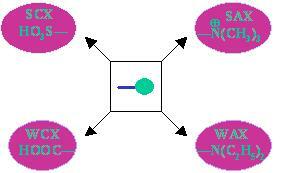 As shown in Figure above, Proteomix SCX, WCX, SAX, and WAX are strong cation exchanger with sulfonate functional groups, weak cation exchanger with carboxylate functional groups, strong anion exchanger with quaternary ammonium functional groups, and weak anion exchanger with tertiary amine functional groups, respectively. All ion-exchange groups are chemically bonded to the hydrophilic layer coated on non-porous PS/DVB beads. 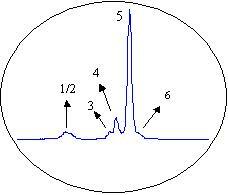 Figure below is a typical test chromatogram for a Proteomix SCX-NP column (3 µm). Extremely high efficiency separation was achieved for 5 proteins. Those proteins were eluted based on their charge state (pI) from low to high: ovalbumin, ribonuclease A, cytochrome C, aprotinin, and lysozyme. At the separation conditions (pH 6.0), ovalbumin is negatively charged and eluted at the void volume, indicating no non-specific bindings. The column dimensions of the Proteomix SCX, WCX, SAX, and WAX products are 0.75, 2.1, 3.0, 4.6, 7.8, 10, and 21.2 mm I.D., and 2, 3, 5, 10, 15, 25, and 30 cm length. Sepax also offers custom-made columns. 4,000 psi for 10 µm resins; 6,000 psi for 5 µm resins; 8,000 psi for 3 µm resins; 12,000 psi for 1.7 µm resins. Typically 0.5 and 1.0 mL/min for a 2.1 and 4.6 mm I.D. column. The Proteomix columns are compatible with both aqueous solution, and a mixture of water and organic solvents, such as acetonitrile, methanol. Typical buffers include phosphate for SCX and WCX ion-exchangers, and tris for SAX and WAX ion-exchangers. The Proteomix SAX and WAX columns are compatible with nonionic and zwitterionic detergents. The Proteomix SAX and WAX columns are incompatible with anionic detergents. The Proteomix SCX and WCX columns are compatible with nonionic and zwitterionic detergents. The Proteomix SCX and WCX columns are incompatible with cationic detergents. It is well known that the non-porous resin maximizes the mass transfer and minimizes the lateral diffusion, resulting in high speed and high efficiency separations. However, due to the low surface area, the separation capacity is low. The low capacity issue creates a great challenge for many applications for the non-porous resins. The Proteomix ion-exchange resins developed by the Sepax proprietary technologies have a breakthrough on the improvement of their capacities for the non-porous resins. This new technology enables the capacity of the non-porous resins increased to the comparable level to that of the porous resins. 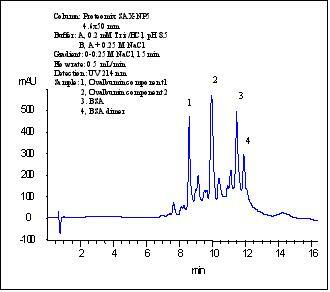 * Dynamic binding capacity test conditions: 1) For Proteomix SCX and Proteomix WCX, Sample: 3.0 mg/mL lysozyme in 20 mM sodium phosphate buffer, pH 6.0; Flow rate: 0.5 mL/min (0.25 mL/min for 1.7 µm); Detection: UV 254 nm. 2) For Proteomix SAX and Proteomix WAX, Sample: 3.0 mg/mL BSA in 20 mM Tris/HCl, pH 8.0; Flow rate: 0.5 mL/min (0.25 mL/min for 1.7 µm); Detection: UV 280 nm. High dynamic binding capacity leads to high sample loading without deterioration of the separation efficiency and the resolution. Figure 1 shows the elution of cytochrome C with the loading up to 200 mg for a 1.7 µm Proteomix SCX non-porous resin without any deterioration of the separation. The Proteomix SCX-NP, WCX-NP, SAX-NP, and WAX-NP resins are based on a nonporous PS/DVB particle that is coated with a proprietary hydrophilic layer and functionalized with a uniform ion-exchange layer. Those phases have three unique features. First, the nanometer thick hydrophilic layer completely eliminates the non-specific interactions with the biological analytes. Second, non-porous beads minimize the biological analytes' lateral diffusion and suppress their diffusion into the chromatographic bed. Third, Sepax's proprietary technology synthesizes a uniform and densely packed layer of ion-exchange functional groups. 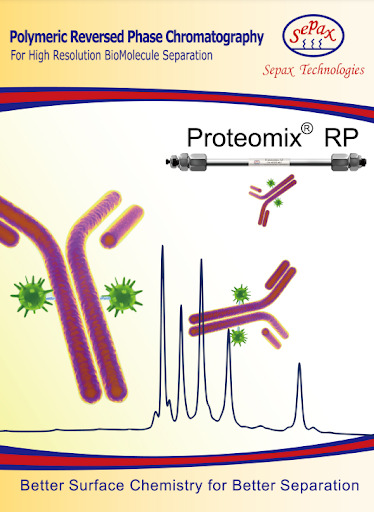 Such uniquely designed Proteomix SCX-NP, WCX-NP, SAX-NP, and WAX-NP phases offer the highest resolution and efficiency separations for proteins, oligonucleotides, carbohydrates, and peptides. 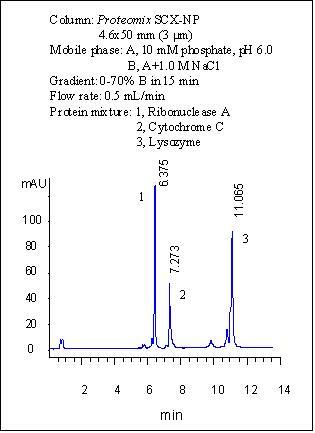 Figure right is a typical test chromatogram for separation of three proteins: ribonuclease A, cytochrome C, and lysozyme by a 4.6×50 mm, Proteomix SCX-NP column (3 µm). The efficiency of lysozyme reaches 100,000 of plates with 5 cm long column. The unique the Proteomix SCX-NP, WCX-NP, SAX-NP, and WAX-NP phases offer highest selectivity for protein separations. 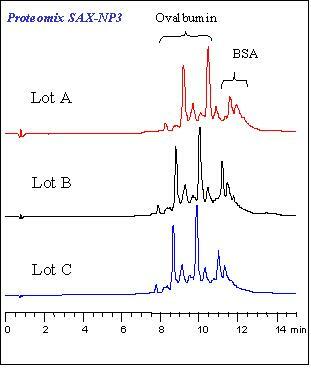 Figure left shows an elution profile of lysozyme by a Proteomix SCX-NP3 phase (3 µm). Six peaks are well resolved with a short column (4.6×50 mm). 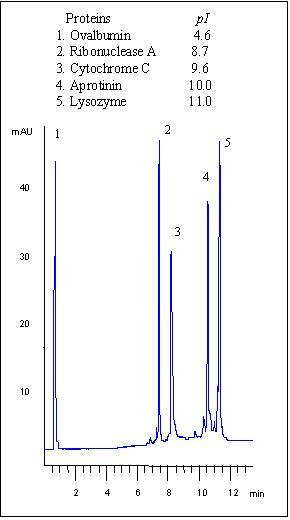 Figure right is a typical test chromatogram for a 5 µm, Proteomix SAX-NP column for separation of a mixture of ovalbumin and BSA. The high resolution and high selectivity of the Proteomix SAX-NP phase can well separate the impurities contained in the ovalbumin mixture, as well as the BSA dimer from BSA. The smaller the particle size, the better separation efficiency and higher separation speed. The Proteomix ion-exchange resins have a wide range of the particle sizes from 1.0 to 10 µm for analytical and semi-preparative separation applications. Figure 5 is the separation of three proteins by four weak cation exchangers with the particle size of 1.7, 3, 5, and 10 µm, separately. It is clearly seen that the smaller particle generates higher efficiency and resolution. 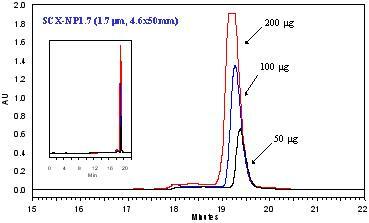 One of the impurities in lysozyme labeled by Peak N is barely separate with the 10 µm WCX column. For 5 µm WCX exchanger, it is almost a baseline separation. When the particle size is decreased to 3 µm, it becomes a baseline separation. With the particle size further decreased to 1.7 µm, the impurity is well separated. With well controlled polymer resin production and the surface chemistry, the manufacturing of the Proteomix ion-exchangers is highly reproducible. The typical variation of the retention time is less than 6% from batch to batch. 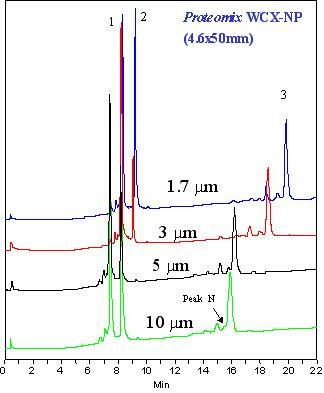 One example is shown in figure below for the production of three lots of 3 µm Proteomix SAX-NP anion-exchanger.